When it comes to group growth, the 1st Cloverdale Scout Group is one to be reckoned with. Over the course of the last year, they managed to grow their membership in each Section, right from Beavers to Rovers. Last year the Group only had 14 youth members and now they have a total of 46 – that’s an additional 32 youth and a growth of 230%! If you’re wondering how they managed to grow so significantly in just one year, you’re not alone. Group Commission, Tom Waldock, was kind enough to take the time to chat with ScoutScene and fill us in on their growth story. At the beginning of the 2014-15 Scouting Year the 1st Cloverdale Scout Group was looking to grow their membership. With the help of Katzie Elementary School, Terry Campbell and a few key Scouters, this was made possible. As a relatively new build, Katzie Elementary proved to be a great location to host community events, including a Scouts Canada open house. It was in this space that Scouter Terry Campbell was able to give a short speech to neighbourhood parents about the great adventures that can be had in joining Scouts Canada. Parents were later able to speak one on one with Scouters to further get to know them and ask questions as they pleased. “Terry has a wonderful way of speaking to parents. His talent is quite amazing to watch. We have Terry to thank for being so helpful. We couldn’t be happier with the outcome of the event,”said Tom. With the new Beaver Colony, we put lots of effort into training brand new Scouters and they ended up being gang busters. The 1st Cloverdale Scout Group has been around for 108 years; making them one of the oldest Scout Groups in Canada! So it came as no surprise when Tom stated how fortunate he felt to be given the opportunity to continue to expand this Group. 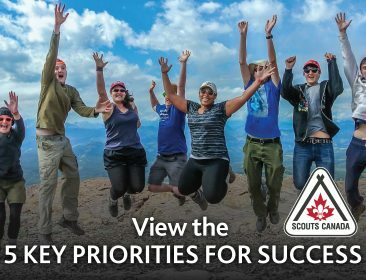 Are you interested in growing Scouting within your community? Check out all the Group Growth stories within the ScoutScene Archives and discover how you can make your Group grow! What do Scouts and scientists have in common? More than you would think!